churches, North and South, over the issue of slavery. By 1847, Industry was well established through the hard work of its German settlers. It had postal service, a hotel, and a drug store, but no church. 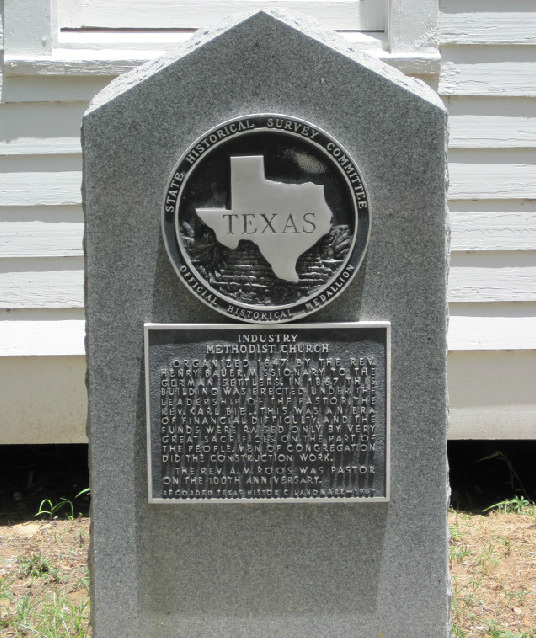 Reverend Henry Bauer, a member of the Methodist Church North, came to Industry after serving as a missionary to German settlers in Texas. A congregation was organized, a building erected, and services held as an independent "Brother Church". When Reverend Bauer was called to mission work in Nicaragua, the Texas Conference of the Methodist Episcopal Church - South appointed Reverend F. Vordenbäumen to serve the church at Industry. Under his leadership the church grew to 125 members. During the Civil War, the church was conflicted between those who felt allegiance to the "northern" church of Reverend Bauer and the "southern" church of Rev. Vordenbäumen. In 1866, some members of the church voted to establish the congregation as a part of the northern Methodist Episcopal Church, while others maintained their relationship with the Methodist Episcopal Church - South. These groups existed separately until 1903 when the Methodist Episcopal Church - South congregation was discontinued. The historic white church, which still stands on our property, was built in 1867. It has been designated as a state historical site and continues to be used for Special Worship Services, 5th Sunday Hymn Sings, and weddings.